Chances are good that most of the people on your holiday shopping list own smartphones--which is pretty convenient, since a smartphone case or accessory is one of the easiest gift ideas no matter who you're shopping for. Plus, it's something that the recipient can actually use (unlike last year's sweater fiasco). With a plethora of cases available, it should be simple enough to pick one (or ten) for every person on your list. But it's not just as easy as throwing any old case in your cart and clicking the Checkout button. Here's a short list of what to consider when you're shopping for a smartphone case (and some bonus pointers on selecting other accessories). What kind of phone does the person have? No matter how rad that iPhone 4s case is, it's unlikely to be of much use to your nephew if he owns an iPhone 5. To start, find out exactly what brand--and model--of phone you're shopping for. 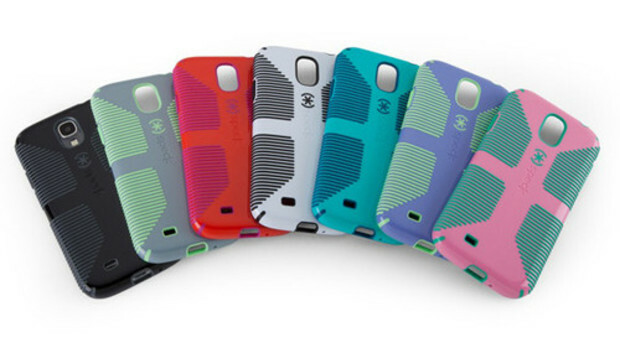 Most case manufacturers offer styles that fit a variety of smartphones, including models from Apple or Samsung. Next! In addition to protecting a phone, many cases are designed to be easy to hold. Speck's CandyShell Grip case is popular for a reason: Texturized silicone strips ensure that the phone remains in the user's hands during vigorous group-texting sessions, while a dual-layer and raised bezel physically safeguards the device. Another contender is the Knucklecase, which has an imposing look but actually offers a stellar way to keep a device safely in hand. Another aspect to consider: What are you protecting the phone from? If your gift recipient is worried only about dropping their precious cargo, many cases will do, and some, such as Incipio's Silicrylic line, are designed for shock absorption. Smartphone theft is a huge problem--help your loved one stay safe with a case that offers extra security features. For example, the Yellow Jacket case doubles as a stun gun (and can charge the phone should it run low on battery power). Kensington's BungeeAir case securely tethers the phone to a small fob; if the owner walks too far away from the phone, the fob triggers an alert (and the companion app automatically password-locks the phone). Meanwhile, the Coyote Case comes equipped with a 100dB siren that the user can deploy in emergencies. Although almost any case will do for day-to-day use, what about people who like to go running with their smartphone? Or those who take a lot of pictures? It's a good idea to have some idea of how your intended recipient is using their phone. For example, if you know that your neighbor hates carrying a purse or a fat wallet, consider something like the Case-Mate Pop ID case, which features a pop-out slot on the back with room for an ID card or credit card. The Pop ID case has cutouts for the camera as well as textured sides for easy gripping. Another contender, the Byrd & Belle iPhone Wallet, is a stylish accessory made from black leather and felt wool, with an exterior pouch for cash or cards. Other cases offer a variety of features: The TaskOne has a fold-out multitool. The popular Mophie Juice Pack provides plenty of additional battery power. And Incipio's Kicksnap and Speck's SmartFlex View both offer fold-out stands on the back. Rokform's Rokshield is designed for mounting the case on a car dash (the mount is sold separately). If you're looking for something with a little more style than your average case, check out the GelaSkins line, which is not only lovely but also highly customizable. These colorful, artsy skins are perfect stocking stuffers for the creative individuals in your life. In addition to classic offerings from the likes of Van Gogh, you can find cases with works from up-and-coming artists such as Camilla d'Errico and Colin Johnson--the selection includes everything from street-art designs to flowy, ethereal prints. You can even upload your own images, so you have an endless number of options. What if you don't know what kind of phone your Aunt Grace has? What if you would rather die than encourage your little brother's terrible taste in art? What if you know for a fact that your dad will have a new phone by New Year's? No problem--plenty of mobile accessories are device agnostic, and are therefore even easier to pick up on the fly for almost any gift-giving occasion. Budding--or expert--photographers will certainly appreciate ways to improve their smartphone shots, and a variety of lenses can help. Photojojo's camera lenses are available in macro (for ultraclose shots), telephoto (for long distance), and fish-eye (180-degree angle), and they stick on to the camera lens of your smartphone of choice. Another fun (and affordable) option is the Macro Lens Band, which is basically a rubber band with a macro lens on it; the accessory is easy to stretch around any smartphone. Another alternative for smartphone-photo fans is a solid stand such as the GripTight GorillaPod Stand. It should prove to be especially handy, as it clips onto a smartphone and uses three bendable legs to hang on to almost any surface. Not only can this flexible stand serve as a tripod, but it can also wind around a tree, a chair, or a rearview mirror to help take video or timed shots. Don't want to take even that much of a risk? Go for the most risk-free accessory of them all: more power. A portable rechargeable battery such as Incase's Portable Power 2500 or the HyperJuice Mini will let your gift recipient juice up any gadget that charges by USB. And no one can ever have too many places to charge their phone: Griffin's PowerDock 5 is a desktop charging station capable of handling up to five devices simultaneously. This nifty dock is simple but incredibly useful, with short USB charging cables that loop from the base directly into smartphones, tablets, or MP3 players, keeping cable clutter to a minimum. Orico's 4 Port Charging Station also does a neat job of powering up multiple items at once. Looking for something a little more portable? Aviiq's Felt Portable Charging Folio will appeal to jetsetters, and includes a 5200mAh battery. How about something stylish, such as a charging station made from mahogany wood? Or one that resembles a plot of Astroturf? Or one made from repurposed wood? Or an old book? Yeah, we can manage all that. Heck, if you're looking for a homemade gift to give, you can even craft your own from an old breadbox.